I'm looking for the "drill-down" functionality within an existing pivot table in LibreOffice Calc. Does it exist ? If not, is there any workaround ? 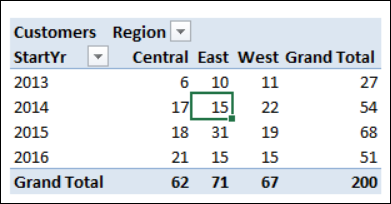 2. the double-click opens a new sheet within the file and shows the detailed data, which summed up give the value of 15 customers for this region and Year. Drill down functionality exists in LibreOffice Calc pivot tables if the option is enabled. From the Pivot Table Layout dialog, expand Options (click on +) and check the box for "Enable drill to details". 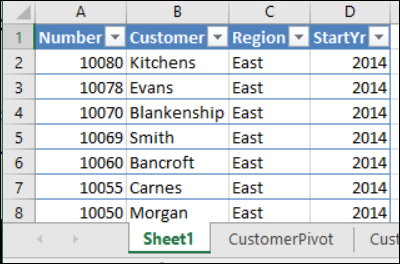 Double click the count cell "15" in the example pivot table will open a new worksheet with the details of the 15 customers. Thanks very much ! It is quite easy indeed :) I am using a French version, and the translation was not obvious understandable to me: "Enable drill to details" > "Activer le rappel des éléments"